Greta Gerwig plays Maggie, a young woman who wants to have a baby, but without the icky complications of the normal method. It’s artificial insemination all the way for her, and she has a guy picked out. His name is Guy, which is a good example of the offbeat humor in Maggie’s Plan. The plan is for Maggie to do the insemination herself and raise the baby on her own, with no help from the Guy. But around the same time that Maggie is enacting her Plan, she falls for John, a fellow professor played by Ethan Hawke (“Boyhood”). John happens to be married to a strict, controlling, and incredibly smart department head named Georgette and played by the inimitable Julianne Moore (“Still Alice”). Before too long, Maggie has absconded with John, and the two marry, leaving Georgette behind. And, so far, the Plan has worked out fine, because Maggie gives birth to a sweet little girl who’s accepted semi-warmly by John’s kids (with Georgette). And that’s where things fall apart. A change in plans, the best-laid plans, you name the old saying, it applies here. Maybe Maggie doesn’t know everything after all — maybe trying to plan stuff well in advance and in detail is a bad idea. But we’re not even up to the second of Maggie’s plans, a plan I can’t really get into here without running into spoilers. Suffice to say that there’s conflict in marital paradise. Maggie’s Plan works in several ways. It’s exceptionally well cast; Gerwig is a standout, and Moore absolutely propels the movie with her luminous presence. (Hawke plays the same kind of self-absorbed writer-manchild he played in Richard Linklater’s “Before” films). The three leads have fine chemistry together. The fault lies not in the acting but in the writing. Maggie is a quirky individual in her own right (which is probably why Gerwig was cast, as she seems to be a perfect fit as her recent roles in “Mistress America” and “Lola Versus” show), a woman who likes to do the right thing and solve problems and make sure everyone’s happy. She’s not a dimwit, although her positive nature sometimes makes others think there’s a screw or two loose. No matter, she’s soon taking care of John’s kids along with her own toddler, while teaching and mentoring, as John himself works on his perpetual novel. Maggie’s okay with this because she’s filling a need. She’s kind of owning her own destiny. So why is this an issue? It felt to me like Rebecca Miller (who also directed) worked hard to establish Maggie as this highly individualistic character who was also selfless and understanding, only to pin an entirely different set of characteristics on her very late in the film. To that, I attribute a need to make Maggie the quirky ideal, which results in her (and the film) being too quirky by half. I think I’ve reached my “quirky” ration for this review, perhaps for all time. A smaller issue I had related to characters. The first guy we meet is the potential sperm donor, Guy (Travis Fimmel, “Vikings” TV series). Guy is not John, obviously, but I didn’t get that at first. I thought he was Ethan Hawke with a long beard. Then we see Ethan Hawke himself, clean-shaven. I thought THAT was a flashback to when Maggie met John for the first time. Wrong again. Took me like 15 minutes to figure out they were different people entirely. Then there’s Maggie’s friend Tony (Bill Hader, “Trainwreck”). When we first meet him, he’s pushing a kid in a stroller. It wasn’t immediately clear to me if he was Maggie’s brother (and the boy her nephew) or her ex, or just a pal. That relationship wasn’t cleared up (for me) until about halfway through the movie. But aside from the over-quirkiness (there’s that word again) and character issues, I kind of wish the plot had focused more on Maggie’s second Plan than her titular one (the insemination thing). That was an interesting, compelling plot point, and Julianne Moore really runs with it. But it doesn’t even make an appearance until well into the movie, so the thread is addressed somewhat haphazardly. A little more focus on this particular conflict would have helped the story, I think. 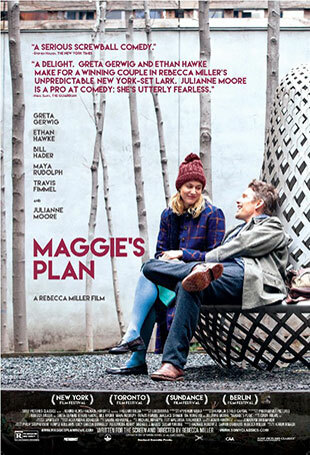 Essentially, I found Maggie’s plan to be a little too convoluted and complicated for my taste, that there was far more signal than noise. (I also didn’t care for the apparent contradiction that Maggie professed to be of strong moral fiber but behaved oppositely). I felt that not enough attention was paid to Moore’s Georgette, a strong and complex character if there ever was one. And finally, although one of the later knocks on Maggie is that she views everything as a zero-sum game (yes, even love), Maggie’s Plan itself contains what’s basically a happy ending. Thus proving her view to be the right one — that everyone can be a winner if you just wish hard enough. She is damn good at it but I’m tired of seeing Greta Gerwig play the quirky, perpetually-finding-herself hipsterette role.